Last month was the annual California Peace Officers’ Memorial Ceremony in Sacramento, as well as the National Law Enforcement Officers Memorial Ceremony in Washington, D.C. Both were solemn events that stunningly honored our fallen heroes from 2015 and one officer from years past who was formerly unrecognized. PORAC once again had the privilege of providing lunch for each person attending the state ceremony. In early May, your PORAC Board of Directors met in Sacramento in conjunction with the memorial ceremony. Four times a year, the Board meets to discuss issues facing our members. We should be very proud of the dedication each Board member is demonstrating on behalf of all peace officers in California and Nevada. During this meeting in particular, several Assembly and Senate races were discussed and many endorsements were either made or codified from past meetings. Many bills were also discussed and positions taken to support or oppose specific legislation. Once again, PORAC is the leader throughout the state in advocating for the rights and benefits of all peace officers. On PORAC’s annual Legislative Day, members of our Board of Directors, chapter presidents and association leaders from throughout the state converge in Sacramento to walk the halls of the Capitol, discussing legislation PORAC has been working on that could have a tremendous impact on all of law enforcement. This year, several pieces of legislation were pertinent to all of us. SB 1286 (Leno) would adversely impact our current POBR, and AB 1940 (Cooper) will put forward meaningful protections for law enforcement in the use of body-worn cameras. Aaron Read, Randy Perry and Michele Cervone provided PORAC with detailed talking points. After a short briefing, each of us met with our respective legislators and discussed those points. After our meetings at the Capitol, we met with several of these legislators across the street at the Sutter Club for our Legislative Reception. Our event was attended by well over 50 state representatives who had a chance to mingle with the leadership of PORAC in a much more relaxed and informal atmosphere. It was clearly one of our most successful advocacy trips in recent years. National Police Week in Washington, D.C.
Vice President Brent Meyer and I had the privilege of representing PORAC at the National Law Enforcement Officers Memorial Ceremony in Washington, D.C. PORAC has long been a supporter of our local chapters of Concerns of Police Survivors, as well as assisting the National C.O.P.S. organization during National Police Week. 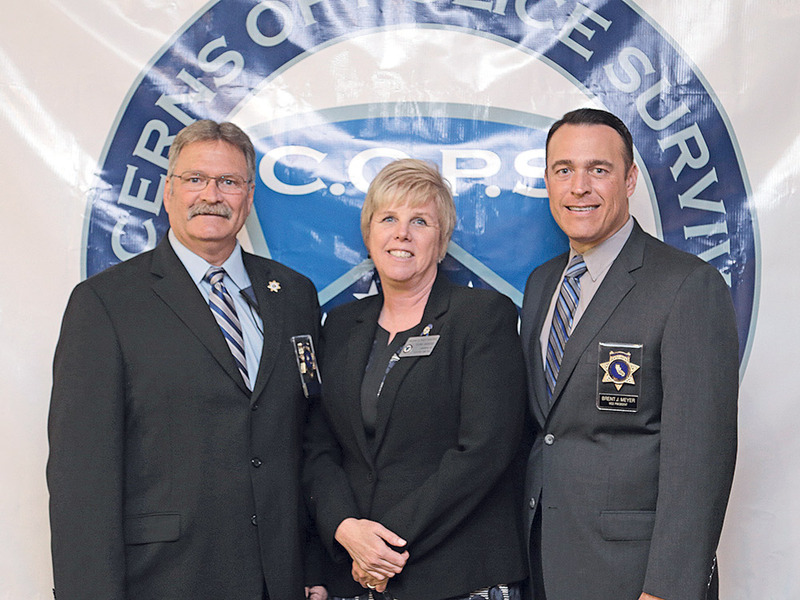 I would like to thank National Southwestern Trustee Tami McMillan for helping PORAC be prominently recognized as a partner with C.O.P.S. I would also like to thank Northern California Chapter President Susan Moody, Central California Chapter President Jim Howell, and Irma Rios and Jeff Huss from Southern California Chapter for their dedication to C.O.P.S. and assisting all of our members who traveled to Washington. More than two years ago, PORAC was a part of a coalition of public safety organizations that assisted in defeating Proposition 34, which would have completely eliminated the death penalty in California. We then made a commitment to assist in writing a proposition that would streamline the death penalty process for the most heinous criminals in our great state. PORAC is very pleased to let all of our members know that our efforts have been successful. In partnership with many other law enforcement groups, district attorneys and several members of the public, we have now qualified our Death Penalty Reform and Savings Initiative for the November general election ballot. Although we still have much work to do, I am confident the residents of California will see that our initiative corrects many issues that have delayed the current process for those condemned to death for their part in the most gruesome of murders, including the slayings of many of our brothers and sisters in law enforcement.